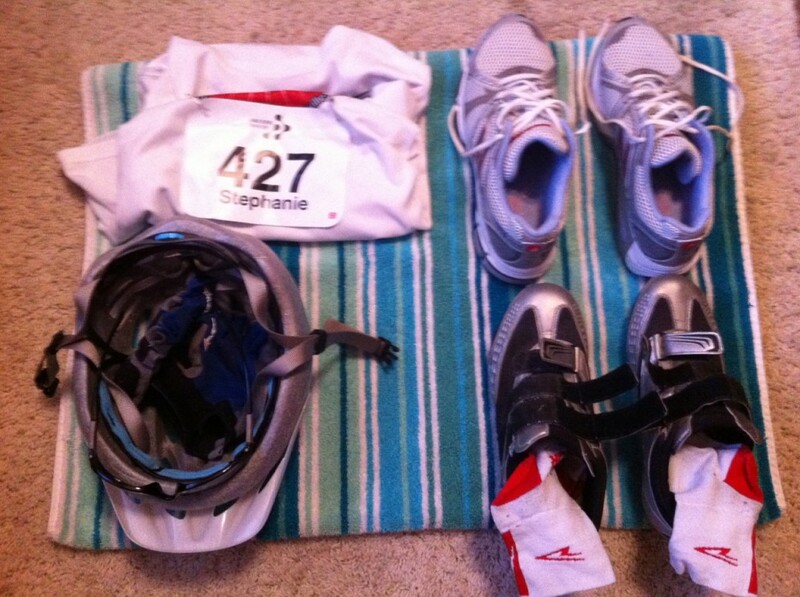 This is the second of my blogs with advice for people doing their first triathlon. The first one looked at what to wear on the big day. This one will deal with the pre race prep – what to do in the week before the race, how to set out your area in transition and the race itself. The week before the race used to be my favourite bit of training – I’d ‘carb load’ (stuff my face) all week and ‘taper’ (sit on my bum). Apparently this is not the best approach! Unless done properly, carb loading doesn’t really have an effect over a week, but do make sure you get a good carby meal the night, or even a few days before. And tapering doesn’t mean stop training. You should keep the frequency of training up, but for shorter sessions and don’t push yourself more than you have in training as your body won’t have time to absorb the impacts and get fitter, and you’ll just be knackering your body. Its even worth going for a quick run and spin the day before, nothing big, just a few short bursts. Also take the time to check over your bike, make sure your gears and brakes work properly, give your chain some tlc, and use a knife or something to pop out any big bits of glass etc that are stuck in your tyres just waiting to give you a puncture. Ok, so onto the day itself. First of all transition – the area where you change between each stage of the race (check race rules to see if there’s any changes to the following, but generally unless you’re in a top race then it should be fairly relaxed). Get there early to set your stuff out. You’ll need to carry your stuff into the actual transition area (only those taking part get a wrist band allowing them into transition) yourself , so personally I would avoid the plastic boxes that the pros go with, and just have a rucksack with your stuff in. Most races let you choose where you rack your bike. Generally there’s no spot that means you’ll have less far to run to get to it, if you’ve got less far after the swim, you’ll have further on the run etc. More importantly it to find somewhere you’ll be able to find again in a panic, either near to an obvious landmark within transition, or in line with a few things outside. 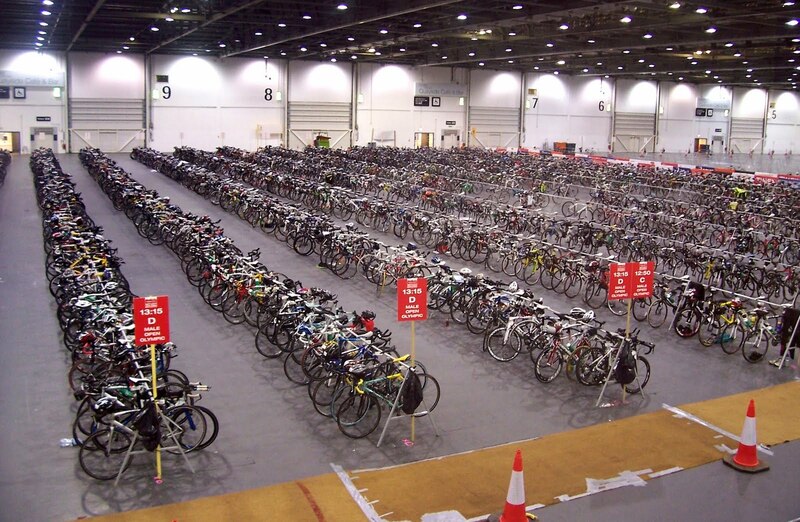 Unless its’ a very small race then it’s a lot harder than you think to find your bike out of sea of bikes with the adrenaline pumping. you want) in the order you need them. I talc my socks and shoes – even if you’re not going for an award-winning transition time it cuts some of the time of your feet getting stuck in wet socks (unless you’re going sock free to save time!). Make sure you know where the ‘run in’ and ‘run out’ and ‘bike in’ and ‘bike out’ are, and where your spot is in relation to them all. Read the race rules, most important but the important bits are put your helmet on pretty much as soon as you get to your bike from the swim so you don’t forget and get penalised. Make sure you know where bike out is, and don’t get on your bike til you get to the mount line. You might need to be careful about people already on the course swapping past as you come out. Depending on the race you may need to count laps. On the swim most indoor races will zig zag across a pool, so other than remembering to duck under the ropes at the right end that’s not too complicated (but do check race instructions for this!!). And open water will only be a few laps, if that, so you should remember. On the bike and run you may have more laps to worry about. For example one of the sprint races I do has 9 laps of the bike course, and its fairly easy to lose count. If you have a watch that should give you a good indication, time your first lap and then keep that in mind for totting up future laps, but I’d also have a fall back. Some people line up elastic bands on their handlebars and move them across as they go, or I go for little stickers on the handle bars which you tear off as you go. Make sure you decide in advance whether the last one you tear off means you’ve got 1 lap to go, or that you’ve finished (i.e. do you put on less counter than number of laps?). It catches me out each time! 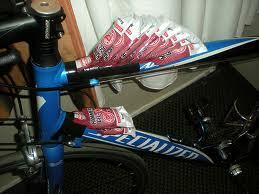 You might not need quite this many gels! This is a whole blog in itself, for now, I’d say don’t try out gels etc unless you’ve tried them before. If you have and you’re happy with them, then you can tape them to your bike to make sure they’re accessible, but don’t overdo it. And get a good meal with plenty of carbs the night before. On the morning, have whatever you normally eat in the morning before training – don’t go eating a plate of pasta if you’ve never tried it before. I go with porridge or muesli, soaked overnight in apple juice so it’s nice and soft. Check out the race info in advance, it will answer a lot of your questions and help you visualise how it all works. If this year’s info isn’t out yet then check last years, it’s likely to be fairly similar but then make sure you check the latest one before the day as well. And you’re not allowed any help on the course (again some races aren’t so strict on this) so make sure you know how to change a puncture and have the basics with you. If you don’t already know, then learn! Chances are it won’t happen, but if you don’t know then sods law it will happen. And if you do, well then you’ve learnt a great new skill! So that’s probably quite enough information for now. Most importantly of all, remember to enjoy it! This entry was posted in first triathlon, Triathlon, Uncategorized and tagged carb loading, cardiovascular, feel fit, transition, tri kit, Triathlon. Bookmark the permalink.